OEM Brander is free portable application designed to allow you to edit OEM branding on a Windows PC. When you buy a PC from a manufacturer, they will usually have the Make, Model and Support information in the Systems Property window, as well as a company logo. OEM Brander enables you to edit this information and to use your own logo, which will be automatically resized and scaled to fit. 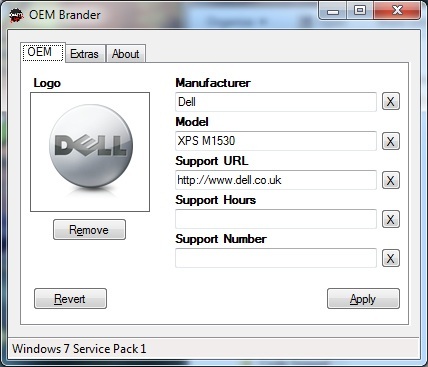 Unlike other OEM branding applications, OEM Brander supports Windows XP and Windows Vista/7, preset manufacturer information and the ability to edit Vista/7-specific images. I have been using winbubble for W7 and Vista and manually doing XP branding. Thought I would try this as it claims to do all three operating systems. Just tried it on a Windows 7 and a Vista machine and it worked perfectly with the added bonus that it does not have all the other garbage that winbubble comes with. Its simple, straightforward and clutter free. They can definately claim me as a convert. To the Author(s), many thanks.